Quilting is a craft with a long history of tradition, which makes vintage quilt patterns particularly special. That's why we've decided to bring together our favorites in 20 Vintage Quilt Patterns and More Traditional Quilt Patterns. Learn how easy it is to give your modern-day quilt patterns a classic touch with traditional quilt patterns like the double wedding ring quilt or the crazy quilt pattern. You'll want to grab your favorite floral fabrics and old fashioned prints for these! Nothing touches the heart quite like the memories that come with classic wedding ring quilt patterns. Liberated Wedding Ring Block - Get creative with a wedding ring quilt block variation. Wedding Ring Motif Wall Hanging - You can hang this colorful motif. Modern Double Wedding Ring Wall Quilt - A more modern option is this double wedding ring quilt pattern. Crazy quilt patterns have been around for generations, and you can make them out of your old leftovers. Crazy Basket Quilt Block - Design a classic basket quilt block with a twist. Basket Weaves Crazy Quilt - Create the illusion of a basketweave pattern with this crazy quilt design. Victorian Peacock Crazy Quilt - Add a Victorian touch with this luxurious addition. Crazy Quilted Heart - This makes a great gift, or you can use it as a pincushion. Crazy Colors Scrap Quilt Pattern - Start your next vintage quilt pattern with a crazy quilt block. These vintage quilts are known for their recognizable style. Easy Log Cabin Quilt Block - Beginners and advanced quilters alike can always count on the log cabin quilt. 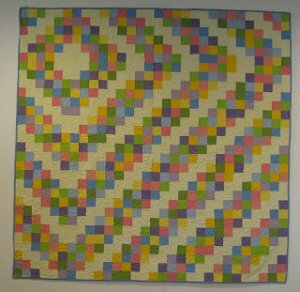 Classic Amish Diamond Quilt - Learn about Amish-style quilting with a simple diamond pattern. Old Money Quilt - Get inspired by Civil War era quilting with a standard stacked coin pattern. Vintage Delight Basket Quilt - Your home will look so cozy with cute vintage basket quilts all over it. Vintage Hankie Quilt for Baby - Quilters for generations have been making keepsake quilts using their hankies. Some of these free quilt patterns just need the right fabric. Vintage Meadow Quilt - Spring has sprung on this vintage quilt pattern. Giant Vintage Starflower Quilt - Liven up a basic star quilt design with flowery fabric. Sweetheart Vintage Sheet Baby Quilt - Another shape that looks even better with old fashioned material is a heart. Here are more ways you can bring back the olden days through your quilting. Church Picnic Quilt - Think back to church picnics with bright cathedral window patterns. Vintage Vacation Quilt - Vintage-style fabric makes this lattice pattern pop. Retro Baby Blocks Blanket - This quick baby quilt pattern was inspired by old fashioned illustrations. 1930s Barn Raising Quilt - No other classic quilt pattern is this mesmerizing!